Yalah surf is small surf house located in the heart of taghazout with a surf and yoga vibe. Our surf house is one of the best places to learn surf, practice yoga and meet people. Our surf house is typically decorated in the Moroccan style, with exceptional views overlooking the well known surf spots (Panorama point, Hash point and Anchor point … etc) all within five minutes drive. We are located only a few metres from the beach with all the comforts of home. Our tranquil house is shared with other surfers, living together in a very relaxed and familiar atmosphere. All surf camp meals are prepared by locals. Enjoy delicious typical moroccan food, from tagine, couscous, fish, and even a BBQ night. We can also accommodate vegetarians and food allergies diet. Taghazout offers all kinds of waves, from gentle beginner waves to heavy reef breaks for more advanced surfers. The best swells hit the region between November and April. The surf house is located minutes from the most famous surf spots of the south: Killer Point, Anchor point, Hash Point, Boilers, La Source, Panoramas, and Banana Point. For more information about all the surf spots, check out our surf guide. The surf house connects like-minded explorers from all over the world together in a chilled out and relaxed environment. 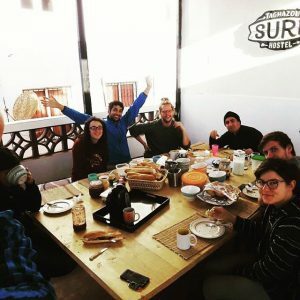 This is a place where beginners and seasoned surfers meet new people, share travelling experiences and chill out or party. Everyone is welcomed as part of the family. From the moment you arrive in Taghazout you will feel deeply in touch with Moroccan life. Our packages also includes visits to the Souk (traditional markets), Paradise Valley and Hammam (steam room where Moroccans habitually go each week to clean themselves).